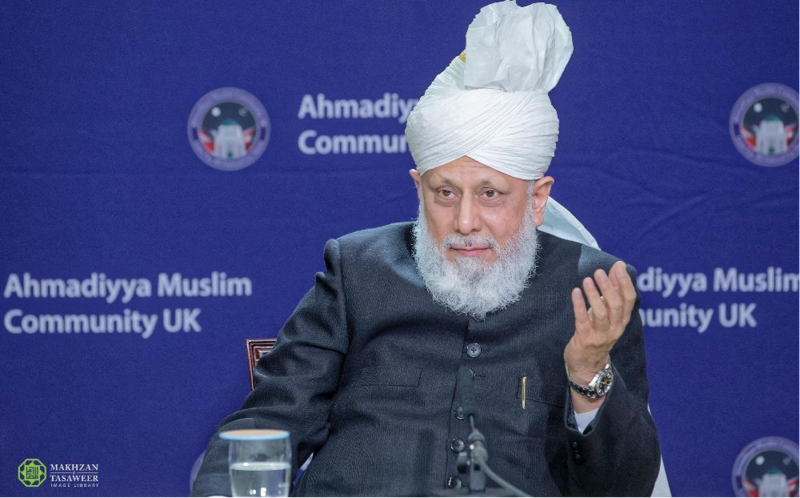 On 17 March 2018, the World Head of the Ahmadiyya Muslim Community, the Fifth Khalifa (Caliph), His Holiness, Hazrat Mirza Masroor Ahmad delivered the keynote address at the 15th National Peace Symposium hosted by the Ahmadiyya Muslim Community UK. The event was held at the Baitul Futuh Mosque in London with an audience of more than 900, from 31 countries, including 570 non-Ahmadi guests comprising Ministers, Ambassadors of State, Members of Parliament and various other dignitaries and guests. 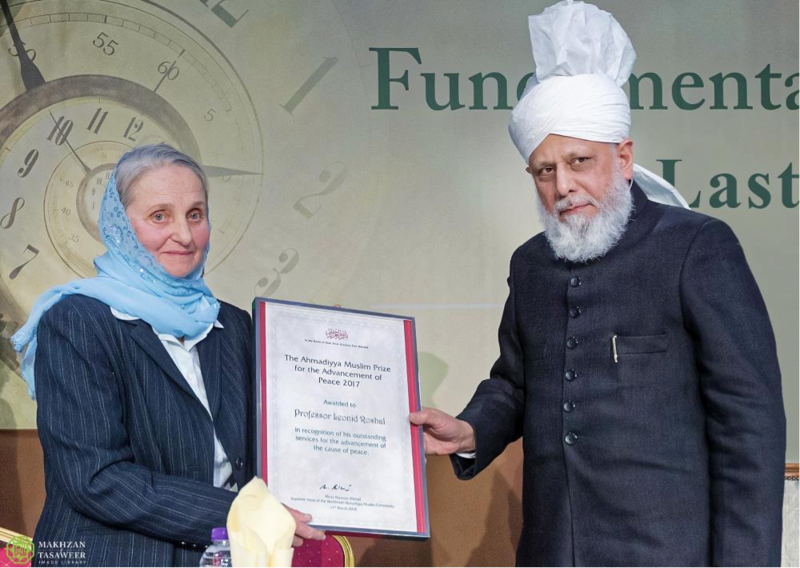 During the event, His Holiness presented Angelina Alekseeva, the representative of Dr Leonid Roshal, a noted paediatrician from Moscow, Russia and Chairman of international charity Fund to Help Children in Disasters and Wars, with the Ahmadiyya Muslim Prize for the Advancement of Peace in recognition of his outstanding medical and humanitarian services. 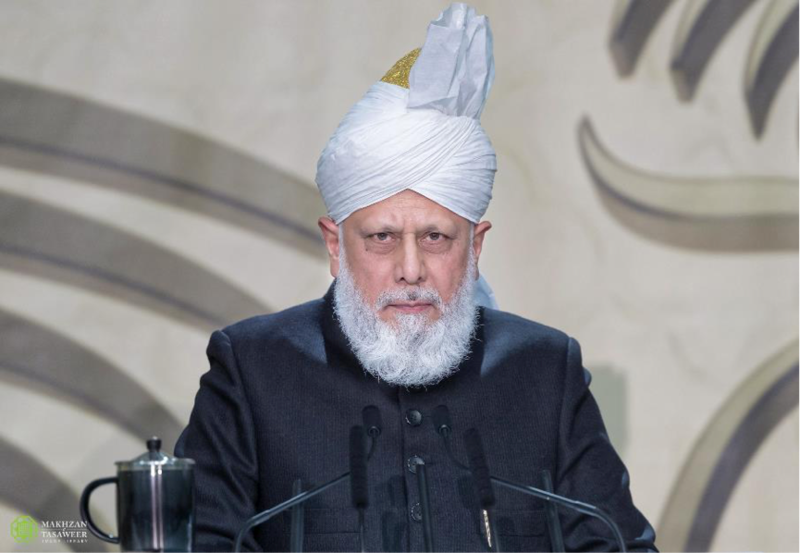 During his address, Hazrat Mirza Masroor Ahmad said that the Ahmadiyya Muslim Community would never cease its efforts to spread peace in the world. He urged world leaders and governments to “change their priorities” and to help ease the suffering of people in developing nations. His Holiness vehemently condemned the international arms trade and said that those nations who were producing weapons being used in war-torn countries had “blood on their hands”. He also said that children born into extreme poverty or in areas of conflict were easy and vulnerable targets for terrorist recruiters. His Holiness spoke of the dangers of extremism amongst Muslims and the increasing threat of far-right nationalists. His Holiness also refuted claims that Islamic teachings promoted any form of terrorism or extremism. His Holiness spoke of the hypocrisy rooted in the international arms trade and the danger it posed to the world. To boost their national economies, world powers were selling “inhumane” weapons that were destroying towns and cities and unjustly robbing millions of people of their futures. He said that in countries like Syria, government soldiers, rebels and terrorists were fighting one another but despite their divergent interests, they all had one thing in common – that the vast majority of their weapons have been produced externally in the developed world. His Holiness said that scores of young children and teenagers in conflict-ridden nations were being orphaned through airstrikes. Such youths were bound to react and were being drawn into extremism. His Holiness also spoke of the repeated foreign policy errors made by certain Western countries. He said that the Iraq War had soon been exposed as based upon false pretences, whilst the intervention in Libya in 2011 had proven to be a complete failure resulting in the country becoming a “hotbed of extremism”. His Holiness also warned about the risk of escalating tensions between the United States and North Korea. Even though the President of the United States had recently indicated a willingness to meet North Korea’s leader, His Holiness warned that there was no guarantee of a deal because hatred was “entrenched” on both sides. His Holiness said that even if a deal emerged between the United States and North Korea there was no guarantee it would hold, and, in this regard, he cited the Iran nuclear deal of a few years ago, which he said was now “hanging by a thread”. Thus, he urged the leaders of all nations and their representatives to tread with caution and to pursue diplomacy and strive to de-escalate tensions. His Holiness concluded by presenting the example of the Founder of Islam, the Holy Prophet Muhammad (peace be upon him). His Holiness described the brutal persecution faced by the Holy Prophet (peace be upon him) and his followers in Makkah during the early period of Islam. For example, Muslims were martyred, were made to lie on burning coals and Muslim women had their bodies strewn to camels that were made to run in opposing directions. Prior to the keynote address, various dignitaries spoke about the importance of striving for peace and religious freedom in the world. Dr Aaron Rhodes, renowned Human Rights activist, co-founder Freedom Rights Project and President of the Forum for Religious Freedom Europe spoke about the persecution faced by the Ahmadiyya Muslim Community in Pakistan. The event concluded with a silent prayer led by His Holiness. Both before and after the proceedings, His Holiness met personally with various dignitaries and guests and held a press conference with members of media.